When your vehicle needs a good shine, visit our car wash in Cedar Rapids, Iowa. Blue Lagoon Storage and Car Wash has the equipment you need, such vacuums and washing tools, to make sure your vehicle looks great. You can select from a variety of wash options to make sure your vehicle gets the level of clean you’re expecting. 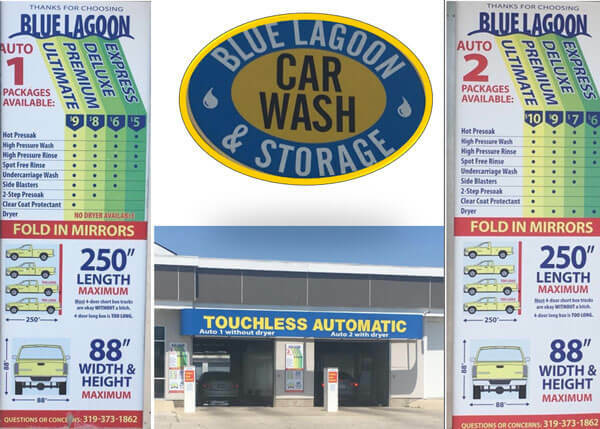 Visit Blue Lagoon Storage and Car Wash today for car cleaning in Cedar Rapids, IA. We accept credit cards and cash at any of our car wash bays and vacuums. Purchase a reloadable wash card to make your transactions easier. Contact Blue Lagoon Storage and Car Wash today to learn more about our car wash services in Cedar Rapids, IA. © Blue Lagoon Storage and Car Wash, All Rights Reserved.